Dimensions 0.59 by 7 by 10 in. Amazon.com description: Product Description: Helen Keller (1880-1968) is a revered figure in American popular culture. Struck deaf and blind by illness at the age of 19 months, she still managed to get an education and become a writer and activist. Her story was further popularized by William Gibson's play "The Miracle Worker," which was also adapted for both film and television. 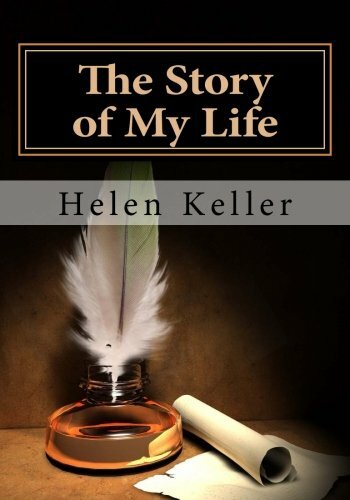 Keller's autobiography, "The Story of My Life," first appeared in installments in "Ladies' Home Journal" in 1902. This book is truly one of the great American autobiographies: an inspiring story of a courageous individual who overcame tremendous odds. Keller writes about many things: her childhood in Alabama; her relationship with her beloved teacher, Anne Sullivan; her attendance at the Wright-Humason School for the Deaf in New York City; and meeting such eminent figures as Mark Twain. She especially stresses her love of literature, which she describes as "my Utopia." Along the way are some fascinating details and profoundly moving passages. Her tribute to the Homer, the blind poet of ancient Greece, is particularly powerful. Her interpretation of the biblical Book of Ruth: a story of "love which can rise above conflicting creeds and deep-seated racial prejudices," is also especially moving.